23 Indian Fashion Terms Every *Desi* Girl Should Know! India is a land of stunning fashion and all creative things that come with it. Be it the riot of colourful textiles, the age old handlooms or just the endless list of embroideries that are native to our country. 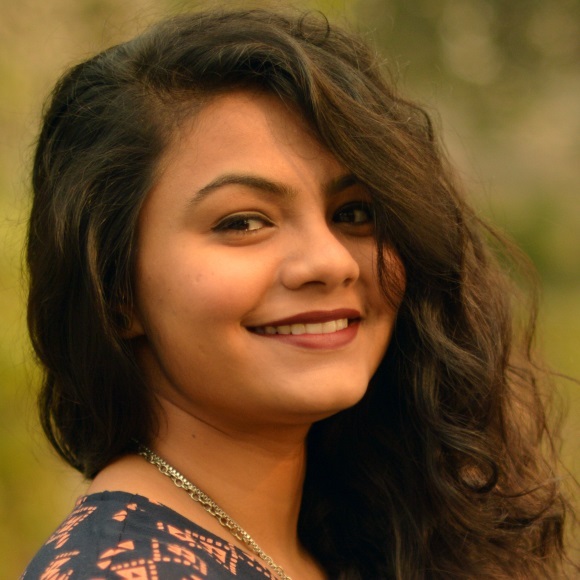 Here is a list of fashion terms desi girls should know, these will help you look for your favourite outfits and explain that kadhai to your tailor! Image: Sabyasachi on Instagram Aari work is a type of hand embroidery that typically helps sew sequins, glitter and more. Aari work involves a hook, plied from the top but fed by silk thread from below with the material spread out on a frame. It looks really glam, golden and shiny. This embroidery is found all over North India. Bandhini is the Rajasthani art of tying small dots on fabric with a continuous thread and dyeing it. The result is a vibrant and irregular mix of vermillion and saffron, emerald and sapphire or aqua and yellow. Interestingly, the art of tying involves the use of a long finger nail, which is used to pick that portion of the fabric which has to be tied. Bandi is a cotton jacket style waist coat made on the traditional Indian handloom. 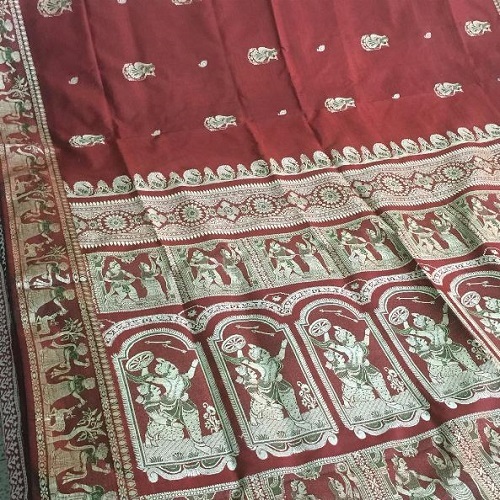 Image: The Fare Art Studio on Instagram Referred to the Baluchari saree, the garment is worn by women across India and Bangladesh. This particular type of saree originated in Bengal and is known for depictions of mythological scenes on the pallu of the saree. The mythological scenes are hand painted with vegetable and other organic dyes making this a true master piece to own. Also read: 10 Simple Styling Tricks To Look Slimmer In Indian Wear! Often referred to the fabric in its entirety, the Banarasi is one of india’s richest, homegrown silks woven from the yarn in Varanasi. They are known for their fine gold and silver brocade or zari, along with the fine silk and opulent embroidery which makes this silk extremely heavy. Chanderi, as the fabric is called, belongs to the Chander region of Madhya Pradesh and is popular because of the history it carries with itself. The fabric is special because it involves the weaving of cotton, silk and zari together - resulting in a fabric that makes Chanderi a really rich fabric to work with. Image: Rahul Mishra on Instagram Chikankari is a popular embroidery form from Lucknow, Uttar Pradesh and unlike other embroideries it is actually done with a white, cotton thread on pastel, light weight fabrics such as cottons and chiffons. It was brought to India by Nur Jahan, who popularized it on muslin and linen fabrics calling it a shadow-work embroidery. 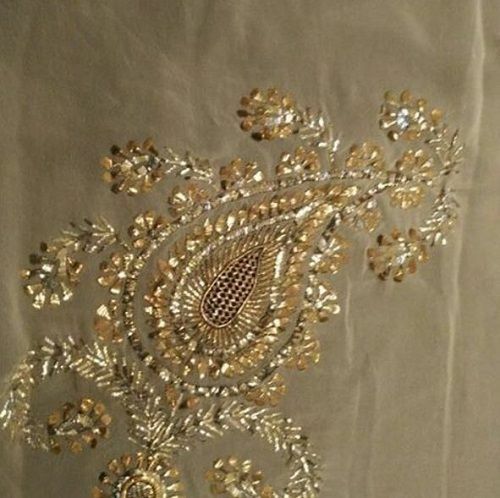 Gota Patti is a type of embroidery that has zari’s ribbon appliqued to the fabric, which is cut in different shapes and sizes to create elaborate patterns. It is the lightest embroidery and is an extremely popular one in Rajasthan, the place of its origin. Ikat is a dyeing technique used to pattern textiles that employs resist dyeing on the yarns prior to dyeing and weaving the fabric. In Ikat, the resist is formed by binding individual yarns or bundles of yarns with a tight wrapping applied in the desired pattern to get the effect and colours. The technique has origins in Orissa and in Andhra Pradesh, both where different patterns are typically known. Image: The House of Kamiarrokni on Instagram Jaali work is similar to Chikankari embroidery, the only difference being in motifs that are drawn in this pattern. The motifs in this are mostly arches and domes that have been referenced from the Mughal architecture and interiors and is created like a cut-work having hollow spaces in the fabric. Jamdani is one of the finest muslin textiles of Bengal, produced in Dhaka district, Bangladesh for centuries. The historic production of Jamdani was patronized by the Mughal emperors. Kantha stitch is a running stitch embroidery done in various colours - that are actually its signifiers and differentiators. They’re usually done on plain fabrics such as raw silks in beige, off white and other lighter colours.This embroidery is usually reversible. Image: Sabyasachi on Instagram Kashida embroidery belongs to Kashmir, and is a beautiful embroidery that’s intricate, ornate and delicate. The embroidery requires great precision and stands out only because of its intricacy. Mostly commonly found on woolen pashmina shawls and phirans. 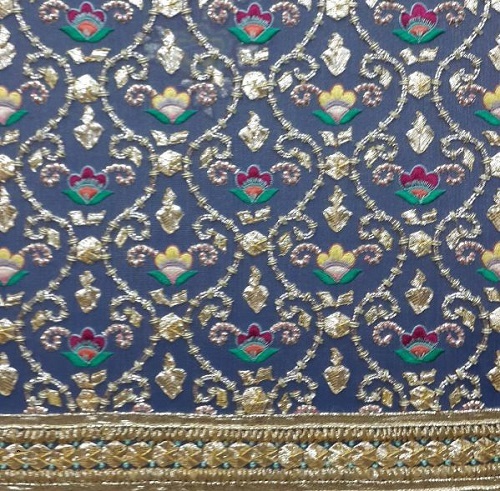 Kali is a type of panel that has a pre-embroidered pattern on it. It is by attaching several kalis that a lehenga or an anarkali suit is stitched together. The term also refers sometimes to a metric term in counting the volume of a garment. As the name suggests, the embroidery technique belongs to Kutchh, and is based on the basic principal of the herringbone cross stitch that is done in a magnitude of colours, on tough fabrics that are difficult to build on. Kutchhi embroidery is mostly found in colourful jackets, and Indian-bohemian bags, also called jholas. 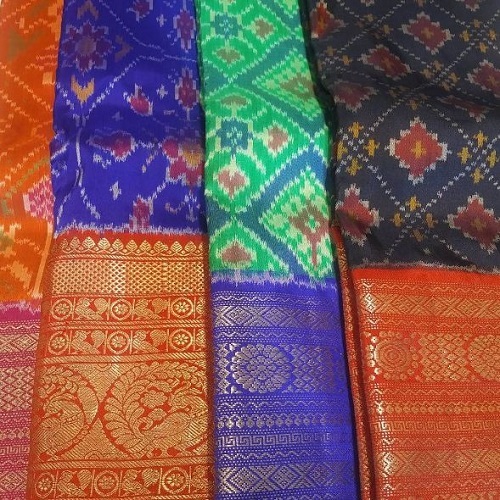 Image: Milap Sarees on Instagram Kanjeevaram is the south Indian version of the Benarasi silk. Kanjeevaram is replete with temple borders, floral designers and epics like the Mahabharata and Ramayana woven in the saree. The Kanjeevaram silk saree is more so famous because of the mulberry silk that’s used in it. Tassels that are used as embellishments to adorn any garment. They’re made out of beads, pom-poms, waste fabric and a lot more. They can be attached to your blouse, onto your lehenga and even on suits. A traditional style of tie-dye practiced in Rajasthan that results in brightly coloured cloth with distinctive patterns. The technique gets its name from the Rajasthani word for wave because the dyeing technique is often used to produce complex wave patterns. Image: Saanviko on Instagram It’s a technique to add shine to any fabric. Small rectangular pieces of metal are squeezed shut around some threads of the fabric. You might remember seeing a heavily embellished Mukaish dupatta from Aishwarya Rai in the song Chaand Chupa Badal Mei from the film Hum Dil De Chuke Sanam. Sometimes, even molten metal is used to stick it onto the garment. 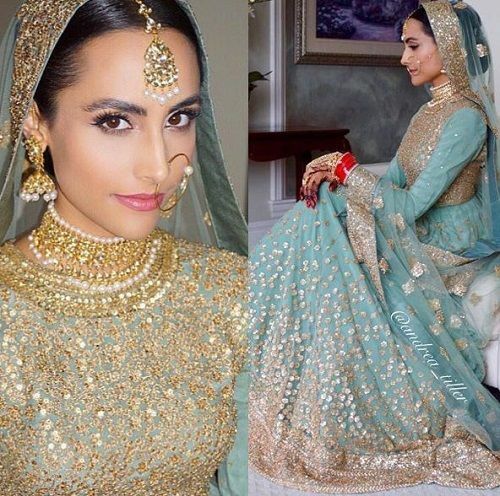 Also read: 10 *Different* Ways To Style Your Anarkali For Diwali Parties! Patola is a double ikat woven saree, that’s made out of silk in Patan, Gujarat - from where it draws its name. The Patola saree is extremely expensive and not very easily available either. It takes about 1 to 3 years to weave a patola saree as the yarn is first double dyed and then woven together. Patola was once worn only by royalty and the aristocracy. A popular form of embroidery belonging to Punjab, and especially the Sindh region, this embroidery is a mix of threadwork and sequins. When the word is broken down, it literally means ‘phul’ meaning flowers, ‘kari’ meaning work, and hence the designs of this embroidery focus around floral motifs. This style uses bright colours, and its dupattas and suits are extremely popular these days! Image: Arpita Mehta on Instagram Mirror work is an extremely popular embroidery form in Gujarat and looks really great, sparkly and festive. Traditionally, the embroidery is done using original glass mirrors that are sewn and tucked into fabric using thread. In recent times though, this has been replicated with shiny, silver plastic that is lightweight and lasts longer. The word Zardozi comes from the two Persian words ‘zar’ meaning gold and ‘dozi’ meaning embroidery. This form uses a metallic thread on fabric and because of that, it can be embroidered onto any fabric from silk and brocade to velvet. It is the most loved embroidery technique of India.